The King’s Daughters’ Home for Women 25th Annual Meeting in 1918 was held at the First Christian Church. A “war-time” luncheon was served at a cost of 25 cents per person. There was no special 25th celebration held, probably due to the Country being at war. It was voted to purchase a $300 Liberty Bond and to recognize this war year as “Child Welfare Year”. Each circle was asked to donate to a newly formed clinic that was one of eight in Illinois. This clinic was to care for Infantile Paralysis victims. Some interesting notes from the Annual Treasurer’s report included that a cow had been purchased for $117 and the yearly cost for the cow and a chicken was $433. For more information on the 25th Anniversary visit the blog here. 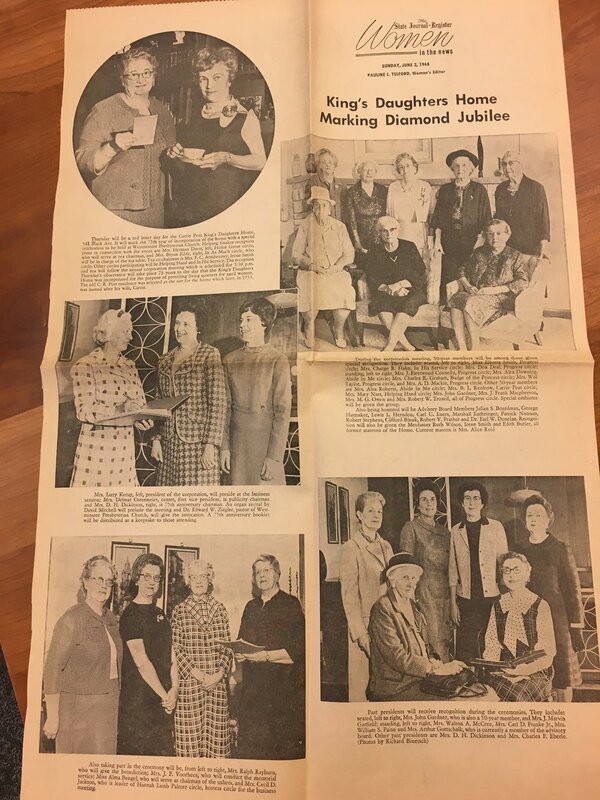 In 1918, the King’s Daughters Organization celebrated their 25th anniversary. This celebration took place during the time of World War I and also during a severe influenza outbreak that occurred in 1918 and 1919. We are thankful for the hardworking women that kept this organization running. In 1943, the Home was at 50 years of service. Again, with our Country at war no 50th celebrate was held. However, a war-time project was established as King’s Daughters’ Cookie Tuesday. Every Tuesday, one circle would send cookies to the U.S.O. Food rationing was on at this time, but the Home had a beautiful garden that supplied many wonderful fresh vegetables. In 1953, a 60th Anniversary celebration was held. A lawn party and tea was held at the Home on June 6. It was noted that Tobin Jewelers lent the organization a silver coffee urn for the occasion. All charter members were honored at this time. That same year, C.W. Post’s mother, Carrie died and the Home was named the beneficiary of a $100,000 trust fund. Although the Home had been referred to as the “Carrie Post King’s Daughters’ Home for Women” since C.W. Post requested it with his donation in 1902, the name of the Home was officially and legally changed in 1953. Connecting property to the west with 80 feet of frontage was also purchased this year. 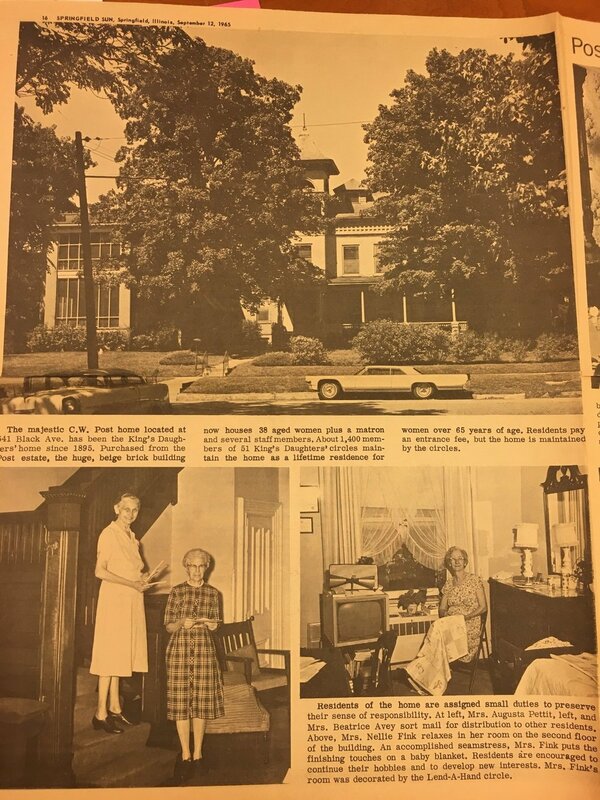 On June 6, 1968 the Home celebrated its 75th Anniversary. There were 50 Circles and a membership of 1454 women. At the 75th Annual Corporation meeting the residents of the Home were honored, 50 year members, past presidents, and the Advisory Board were also honored. 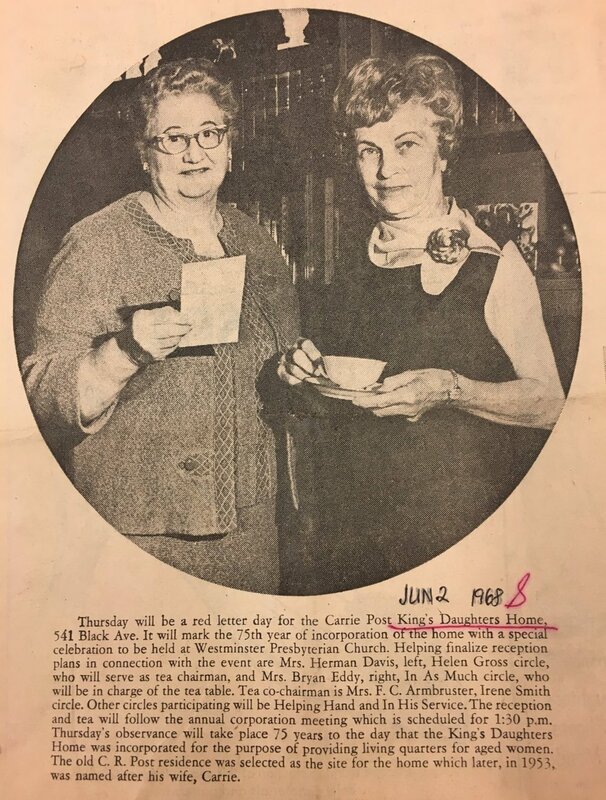 An anniversary tea was held in the Fellowship Hall of Westminster Presbyterian Church immediately following the Corporation meeting. The 100th Anniversary was met with much anticipation. In 1993, then President Christine Parr noted in the Annual Report “We have been excited about the prospects of our 100 year celebration for quite some time. The knowledge that all of us here are part of an organization that has dedicated itself to the same purpose for so many years is indeed exhilarating.” (See article below for entire report). On June 14, 1993, a celebratory tea was held at the Executive Mansion. Other celebrations included an Open House and Tea held at the home on October 21, and on October 27, the First Bank of America hosted a Cocktail and Hors D’Oeuvres to honor KDO ‘s 100 years in the community. With each passing anniversary KDO remembers, honors and celebrates this amazing organization as we also welcome whatever its bright future hold.